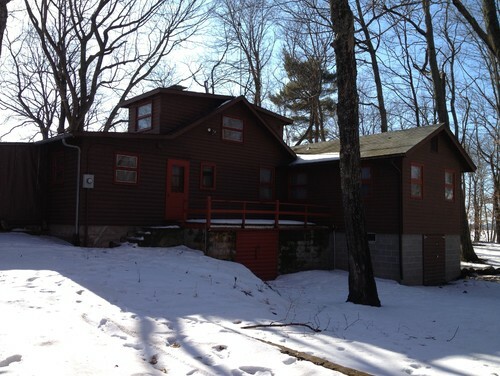 BEFORE: The home had wonderful rustic charm that the family did not want to lose. What they did want to lose was a few cramped hallways full of unnecessary doors. They also hoped to open up the entry and get a better layout in the laundry room. 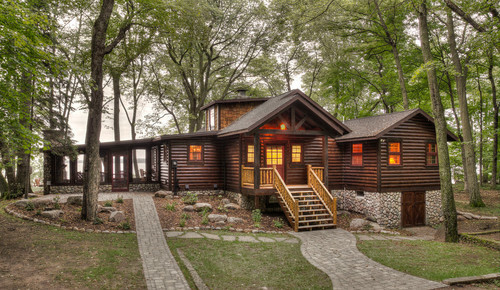 “They really wanted to keep that cabin feel but also incorporate the sailing in because that was a big part of his growing up and being at the lake,” says Renae Balmer, who worked closely with the homeowners on the interiors. AFTER: They designers added only a tiny bit to the footprint. They closed in the deck seen in the previous photo and added a covered porch and new stairs for a grander sense of entry and for protection from the elements when searching for keys. There is also a new chimney off the porch, left. The new main entry gives everyone an ample drop zone for luggage, groceries and sports equipment. Previously, it was a long narrow hallway with no room to plop down and get organized. The space also serves as a laundry room. 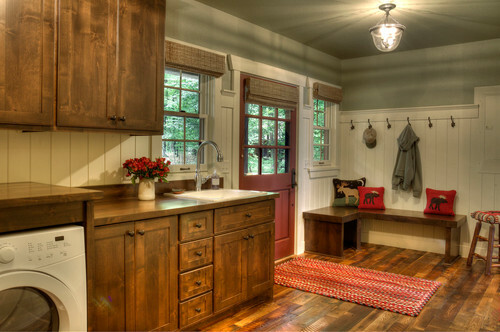 Knotty alder cabinets tie it to the newly renovated kitchen; V-groove pine gives it a cabin look. All of the floors in the house are reclaimed oak. Because space is rather tight, they incorporated the main eating area into the kitchen in the form of this banquette with great views. The original ceilings were all knotty pine. Wherever they had to fill in or replace them, they stained the new boards to match. 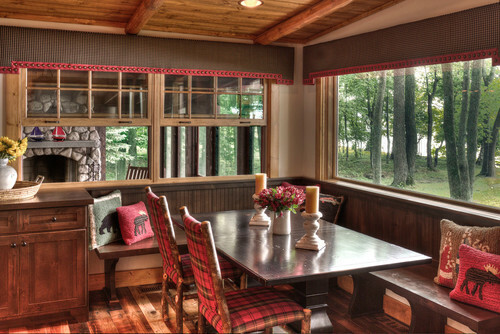 Plaids and playful pillows representing local wildlife add cozy charm to the casual eating area. To the right, the windows create an informal pass-through to the screened-in porch. Chairs, window treatments, pillows via Rustica; most of the furniture, accessories and window treatments throughout the house came from there. BEFORE: The original kitchen was closed off and claustrophobic. 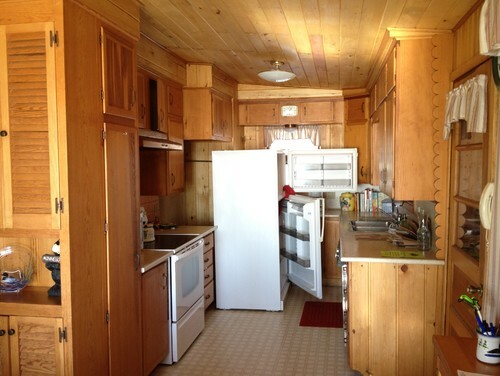 AFTER: Now the kitchen retains the cabin look but with a few modern touches, like clean edges and stainless appliances. 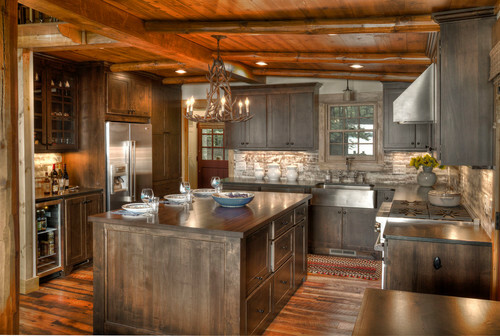 The backsplash is reclaimed barn board, coated with polyurethane to stand up to splashes. “This was a real collaboration between the homeowner and us,” Renae says. “We talked not only about the look but also a lot about function.” For example, a bar and beverage center is just to the left of the refrigerator, while a large island provides a big work surface and storage center. It also holds the microwave. 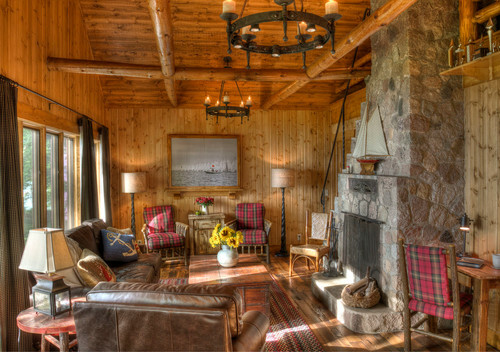 The builders saved the original stone fireplace, knotty pine ceilings and beams. Wherever they needed to replace any of the paneling or ceiling boards during the renovations they stained them to match the original portions. The sailing painting at the end of the room is broken into four panels that conceal the TV. Two new chandeliers add light overhead. Upon entering the master bedroom, you’d never guess it had always been there, or that it once had been covered in drywall. 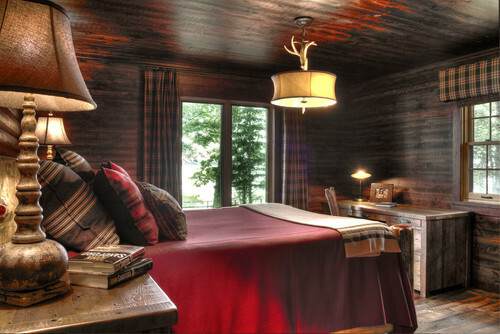 Look closely at the headboard wall — they installed a log cabin wall to make the room look like an addition. “The homeowners wanted to use the same pine wood on the walls and ceiling in here, but they wanted it stained really dark,” Renae says. This makes the room even cozier. 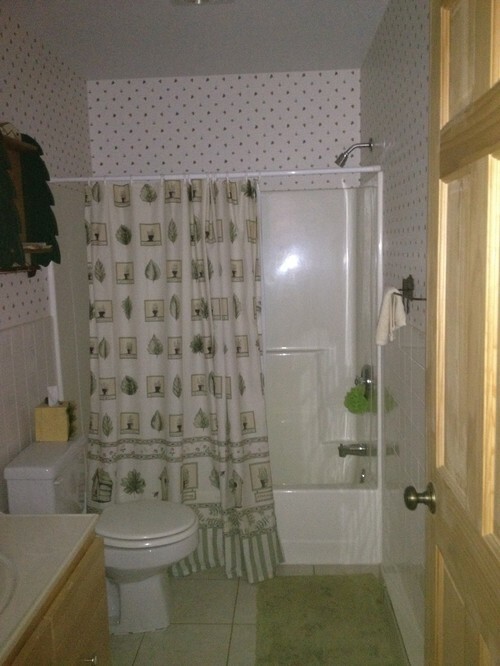 Before, the master bath didn’t reflect a cabin aesthetic. 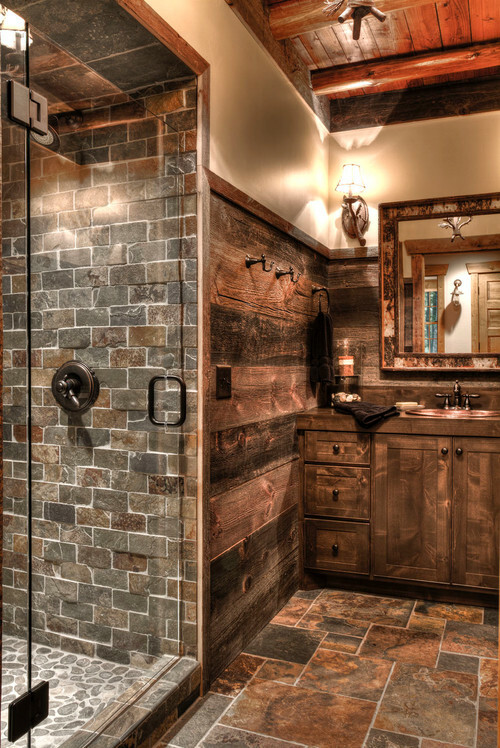 Now, a combination of barn wood walls, alder cabinets, slate tile and river rock tile bring in a rustic look. “The barn wood is so old we didn’t really have to worry about it expanding and contracting,” Renae says. A frameless clear glass shower door makes the room seem much larger than it did with the shower curtain. 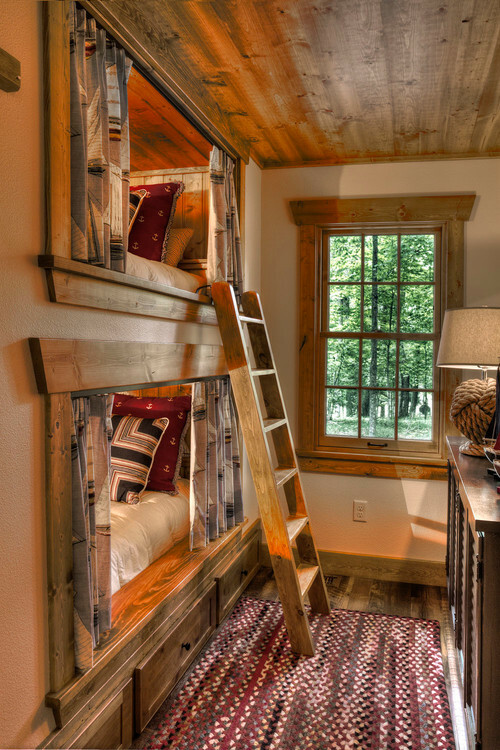 Some clever rearranging turned a tiny bedroom previously just large enough for one twin bed into a cozy bunk room. The curtains have a retro sailboat pattern. The lamp on the console is a ball of rope. BEFORE: Worth noting in the before plans are the entry deck, the hallways and the many doors everywhere, especially in the bedroom hallway on the right. AFTER: As for the changes, one of the most brilliant ones is in the kitchen. 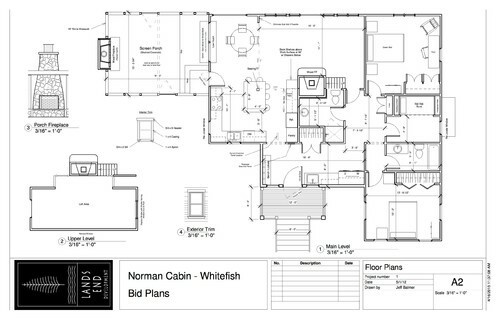 Compare the two plans and you’ll see how they got rid of the narrow hallway and incorporated the space into the new larger kitchen. 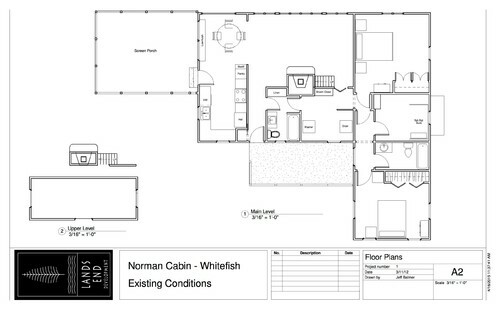 Note: These plans do not show the banquette. “That decision was made on the fly,” Jeff says. Also interesting to study are the changes made to the bunk room, right side center. Next ArticleCould This Be Milwaukee’s Scariest Haunted House?